The picked national selector is currently accompanying the national team for the series against New Zealand and is paid a handsome per-diem of US $ 100 a day (Rs. 13,200), in addition to same five-star hotel accommodation as the Sri Lanka team. This is the first time in history that a selector is accompanying the team during an in-bound tour. Sources said that a per-diem of US $ 50 had been initially suggested for in-bound tours, but had been increased later to US $ 100, the same figure they are entitled for outbound tours after the national selectors had made representations that their regular job would be affected by accompanying the team during the long tours as they would have to take extended leave from their work places. 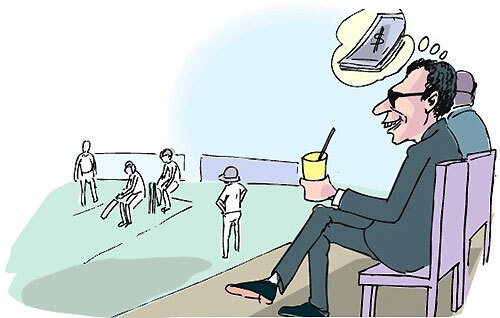 Interestingly, the visiting New Zealand team has no selector on tour and presently many international teams are not accompanied by a national selector though the cash-strapped SLC has curiously stuck to this obviously useless wastage of colossal sums of money. The ExCo has also approved one selector to accompany the national team for the forthcoming tour of Australia and the tour which lasts 58 days will earn the lucky man US $ 5800 (765,600) in per-diems only, in addition to the business class airfare and five-star hotel accommodation for the 58 days. It can be estimated that sending this selector on the tour could cost SLC something close to Rs. three million. With modern day’s communication facilities it has baffled everyone except SLC officials why a selector needs to be on tour with the team at such great expense. This move not only reeks of political foulplay, but also puts to shame the wisdom of several wise men who are already with the team. Team Manager Charith Senanayake, Batting coach Marvan Atapattu, Bowling coach Champaka Ramanayake, Fielding Coach Ruwan Kalpage have all represented the country at the highest level and these men who accompany the team are more than capable of whatever compelling requirement that comes up during a tour for a selector (If that can ever happen). Sri Lanka team is also blessed with coach Graham Ford who has also coached the South African team and has played first class cricket and team trainer Mario Villavarayen who has also played a lot of first class cricket, if those national players are not adequate. As SLC Treasurer Nuski Mohamed warned the SLC ExCo recently, SLC will struggle even to meet their day-today expenses from the second quarter of 2013. Mohamed cautioned that SLC will “end up having cash shortfalls with the consequent inability to sustain our day to day cash operations from second quarter of 2013 onwards” at an ExCo meeting last month. “Next year is a bit of the tough year for us. There are no in-bound tours. We get the TV income only when there are in-bound tours” Mohamed told “Daily Mirror”. Despite all these concerns SLC appears disinterested in cutting down unnecessary expenses such as wasteful pampering of the selectors by sending them on joyrides, an analyst told “Daily Mirror”. Even Haroon Lorgat in his report highlighted the need to stop waste. “All current and future strategic and operational plans (including player payments) need careful review to ensure they are justifiable and focus on delivering the vision and strategy” Lorgat stated. SLC has not given salary increments to their staff for the past three years due to the financial crunch and an insider said it is a crime to waste money on selectors like this. “Lorgat report has recommended appointing full-time professional selectors. That is a justifiable expense. But this is just a joke. What has Sri Lanka team achieved by sending selectors on tours?” he asked. Interestingly, the selector chosen to travel with Sri Lanka team to Australia was a part of the national selection committee which was described as a “bunch of muppets” by Atapattu during the 2006 Australia tour. Atapattu will be travelling this time with a member of that “bunch”. This particular official who is known as the “perpetual selector” has been appointed to the job seven times according to a source and was allegedly the reason Amal Silva’s stepping down from the selection panel. Altogether, there are ten officials accompanying the team on tour of Australia as support staff.